Located in the Southeastern region of the Dominican Republic is the city of La Romana, just an hour and a half drive east of Santo Domingo. Bordered to the south by the Caribbean Sea and to the east by the Rio Dulce, the city has the third largest population on the island with 150,000 inhabitants. La Romana offers golf, tennis, horseback riding and sightseeing at Altos de Chavon, a cliff-side replica of a 16th century Spanish village. Along the cobblestone streets and hidden in the numerous shaded courtyards of Altos De Chavon, visitors will find a tantalizing array of art galleries and shops. La Romana is the nearest point from which to embark on a trip to the islands of Saona and Catalina, world renowned for excellent snorkeling and diving. There are three golf courses open to the general public in La Romana, all operated by Casa de Campo: The Links, Dye Fore and Pete Dye's famous Teeth of the Dog, where eight of the course's holes skirt the edge of the magnificent Caribbean coast. La Romana is one of the fastest growing tourist destinations in the Caribbean, with breathtaking beaches and green mountains, extraordinary resorts and a rich colonial history. Beach lovers come for the endless stretches of pure, white beaches and history buffs find unending pleasure in nearby Santo Domingo's 16th century Colonial Zone. La Romana is an excellent choice for rest and relaxation vacations, honeymoons, family holidays, family reunions, active travelers, scuba divers and golfers. The Dominican Republic was named the 2016 Golf Destination of the Year for the Caribbean and Latin America by the International Association of Golf Tour Operators (IAGTO). Please Note: La Romana is easily accessible from the Punta Cana Int'l Airport. Transfer time to La Romana hotels ranges from just 35 to 40 minutes via new 4-lane highway opened in 2012. Select Punta Cana as a destination, where La Romana hotels are also offered. Be Live Collection Canoa is an all-inclusive hotel that is situated right on Bayahibe's beautiful white-sand beach (La Romana). With spectacular pools and a relaxing Spa, this resort is an excellent choice for a family vacation or a couple’s getaway. Located in one of the most beautiful areas in the country, specifically on Bayahibe’s white sand beach, its scenery will amaze you. Endless activities for the whole family including kayaking, nearby golf and other daily activities, making it the perfect destination for a family vacation or romantic getaway for two. 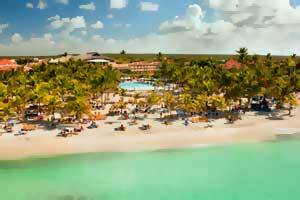 Catalonia Royal La Romana is an all-inclusive, adults-only resort located on the palm studded beaches of La Romana. Enjoy the authentic Dominican Caribbean in an exclusive adults-only resort. The attention to small details and personalized service make every guest feel like they are VIP. Set on the white, pristine sands of Bayahibe-La Romana, Viva Wyndham Dominicus Beach is an all-inclusive tropical escape with endless opportunities for fun and relaxation. Every one of the 538 guestrooms and bungalows is designed with tranquil décor inspired by the island. Dreams Dominicus La Romana offers a family-friendly vacation experience focused on leisure, luxury and entertainment, all in a unique beachfront setting. Unlimited-Luxury® inclusions are offered at this new resort located in Bayahibe, a popular beach destination and fishing town. Families can spend time together in the massive infinity pool and 2 tennis courts. If adults want to spend time alone, they can enjoy the earthy Dreams Spa by Pevonia®, with unique hydrotherapy & indigenous treatments. For the kids, the Explorer’s Club provides a program of supervised activities. Teens can hang out together in the Core Zone Teens Club and enjoy water activities, video games or social mixers. At night, guests of all ages can enjoy the splendor of live shows, themed parties and big screen movies on the beach. Viva Wyndham Dominicus Palace is a beach resort in the heart of La Romana, where Caribbean sea waves meet endless fun and relaxation. 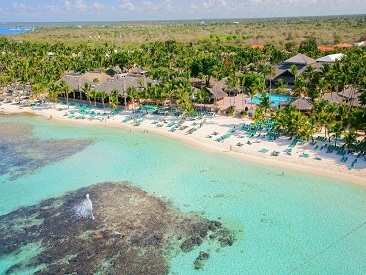 Guests can sunbathe on the stunning shores of Dominicus Beach, which are just steps away from the hotel. Each room is casually designed with island-inspired furnishing and modern comforts. 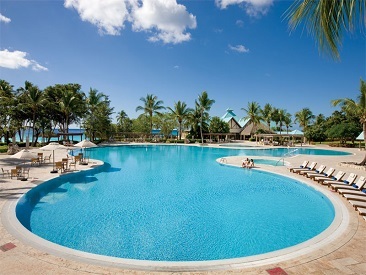 Hilton La Romana is an all-inclusive, beachfront resort for all ages located in the Dominican Republic. With a variety of 7 restaurants, 4 bars, clubs designed just for kids and teens and an all-inclusive plan that includes stylish rooms, all drinks, daily activities and more, Hilton La Romana is the ideal choice for traveling couples and families alike. The adults-only section of Hilton La Romana is an all-inclusive, beachfront resort located in the Dominican Republic. With access to 12 restaurants, 5 bars, a VIP Lounge and an all-inclusive plan that includes stylish rooms, all drinks, daily activities and more, this resort offers a carefree, ideal getaway for adults.